1. By entering any competition and/or accepting any prize (if you are a winner), you agree to be bound by these terms and conditions. 2. The promoter of the competition is 101.9 ChaiFM (“ChaiFM”). 4. We may limit the number of times that you may enter the competition. 5. By entering any competition where the official correct answer is known only by ChaiFM and/or its employees, you warrant that you had no prior knowledge of that official correct answer. For the purposes of this clause, the term “official correct answer” means the solution which is adopted by ChaiFM as its official answer to any competition, which is known only by ChaiFM and/or its employees, and will only be released if and when someone who has submitted an honest entry submits the correct answer. 6. You will be disqualified from participating in a competition and/or receiving a prize if, after an investigation, ChaiFM finds that you had, and were aware of the fact that you had, prior knowledge of the official correct answer, from any source, in advance of entering the competition. 7. It is your responsibility to ensure that all the information which you provide to ChaiFM is complete, accurate and up to date. No entry is valid until the validation process determined by ChaiFM has taken place. 8. Any entries received after the closure of the competition will not be eligible to participate in the competition, regardless of the reason for the late entry. ChaiFM is not liable for any technical failure that may result in an entry not being successfully submitted. 9. Unless specified otherwise, finalists in the competition must be present for the draw where the final winner is determined. Finalists who will not be able to attend the draw must inform CHaiFM at least 48 hours before the draw, failing which they forfeit their participation in the competition. 10. The outcome of the competition is subject to the decision of the judge, presenter or organizer of the competition, whose decision is final, and no negotiations and or correspondence will be entered into after the fact. 11. Participants in the competition enter and/or accept prizes (if they are the winner) at their own risk. By entering the competition and/or accepting any prize, the participants and winners hereby indemnify, release and hold harmless ChaiFM and its affiliates from and against any actions, claims and/or liability for injury, loss or damage of any kind resulting in whole or in part, directly or indirectly, from participation in the competition, and/or the use, acceptance or possession of a prize by the winner and/or any person with whom the winner shares that prize, and/or participation (or non-participation) in a prize-related activity. 12. For purposes hereof, “affiliate” means our partners, co‑promoters and sponsors of this competition, our and their subsidiaries and respective holding companies, the subsidiaries of their holding companies, and our and their directors, officers, employees, agents and representatives. 13. Any prize is accepted by a winner at his/her own risk and ChaiFM and its affiliates are not liable, at any time, for any defect in the prizes. 14. 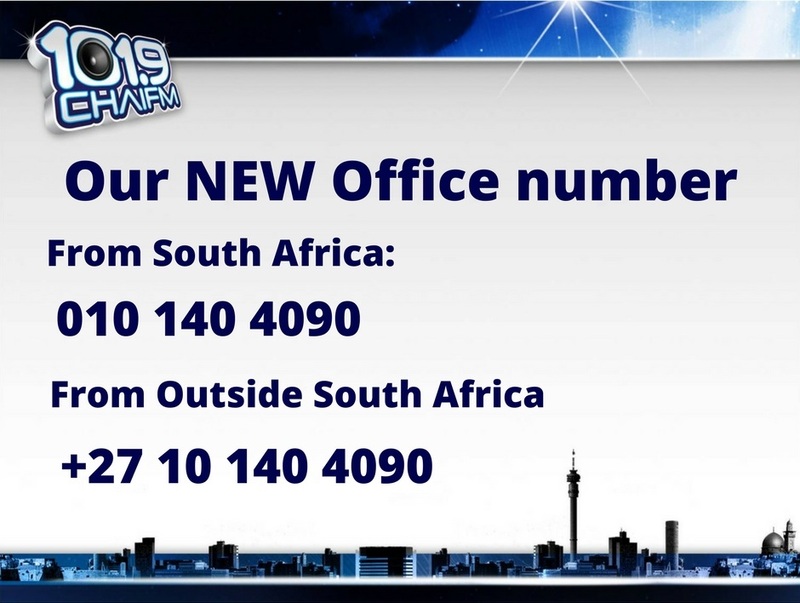 All prizes must be claimed within two months of the announcement of winners on air or on ChaiFM’s website. Prizes not claimed within this period will be forfeited. 15. Depending on the nature of the competition and the prize, ChaiFM may be responsible for delivery of the prizes to the winners. Whilst ChaiFM will make every effort to deliver the prizes to the winners as soon as possible after the announcement of winners, ChaiFM will endeavour to deliver the prize to the winner within four weeks of such announcement. 16. The prizes are not transferable and may not be exchanged or redeemed for cash or any other item. 17. If you win a prize and the possession and/or use of that prize is subject to regulation or authorisation, you must possess whatever documents and permissions/authorisations that are required in order to accept and use a prize and such documents, permissions or authorisations must remain valid for the duration of the use of the prize. It is your responsibility to obtain those documents, permissions or authorisations, which will be at your own cost. 18. You may not win a prize if it is unlawful for us to supply that prize to you. If you do win such a prize, you will forfeit it. 19. ChaiFM reserves the right to vary, suspend, postpone or terminate the competition and any prizes, or any aspect thereof, for any reasons whatsoever and without notice. In such event, you hereby waive any rights or expectations which you may have against ChaiFM and acknowledge that you will have no recourse or claim of any nature against ChaiFM. 20. If you win a prize, you hereby agree to – – the publishing or distribution of your name and details by ChaiFM; – within reason and with prior notice and acceptance, the use your image in marketing material; – subject to your prior acceptance, participate in ChaiFM’s marketing activities; without remuneration due to you from ChaiFM. 21. ChaiFM will not be held liable for any injury, loss or damage of any kind resulting in whole or in part, directly or indirectly, from the publication of your name, details and/or image and your participation in ChaiFM’s marketing activities. 22. Subject to these terms and conditions, ChaiFM will not disclose any of the participant’s personal information to third parties without that participant’s permission. 23. By participating in this competition, you authorize ChaiFM to use your personal information to communicate with you from time to time. You may indicate if you do not wish to receive such communications from ChaiFM. 24. If you or any person with whom you share the prize (if you are the winner), fail to comply with any of these terms and conditions, then without prejudice to any other remedy which ChaiFM may have, – you will be automatically disqualified from the competition; – if you have won a prize, you will forfeit that prize; – you will pay ChaiFM for any loss or damage incurred by them, directly or indirectly, as a result of the non‑compliance, including all of legal costs which they may incur in taking any steps pursuant to the non-compliance; and – you indemnify and hold ChaiFM harmless against any claim by any person, (whether direct, indirect, incidental, punitive or consequential) of any nature, whether arising from negligence or any other cause, relating to any death, injury, loss and/or damage which may be suffered howsoever arising in relation to that non-compliance.